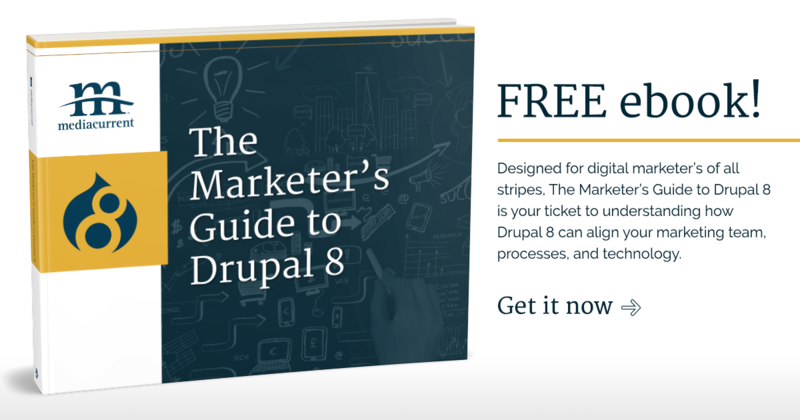 This post is a part of our Marketer's Guide to Drupal 8 series. We created this guide to walk you through considerations for choosing an open source CMS, plus case studies and CMO advice to bring your site to the next level. Since the web was born, information technology (IT) professionals have been working to make sure their organizations had a presence online. In the past few years, we have seen a shift in those digital dollars - right onto the Marketing Department’s doorstep. This signals a larger pivot in thinking. Your website is no longer a stagnant or a “nice to have” piece of technology, but a dynamic, evolving hub for your company’s marketing, branding and lead generation efforts. The development of “decoupled” architecture serves to support this shift by giving marketers more flexibility to create components that provide unique user experiences across their customer’s journey. In simplest terms, “decoupled” refers to the separation between the back-end of your website (your CMS) and the front-end (or many front-ends). You can learn more in a recent article from Drupal’s founder, Dries Buytaert. Here are 4 benefits that Enterprise Marketers should be excited about when leveraging this approach. How often do you say “what if our website could…” and then dial yourself back because of time or resource constraints from your design or development team? A decoupled architecture makes “Yes” a far more often conclusion to support new ideas for your site. Drupal is traditionally more rigid in its design capabilities and while Drupal 8’s integration of Twig has provided a large leap forward, there are still limitations when you’re aiming to create unique, dynamic components to support your campaigns. With a decoupled system, Marketers are free to let their creativity reign, without running into limitations that previously existed. Making the decision for a website redesign is a huge commitment of time and resources. In many cases, marketing teams push their website past its expiration date. Teams are often forced to choose between accepting their website as it stands (even if the design is stale or not meeting expectations) or dedicating the resources for a redesign and potentially placing other strategic initiatives on the back burner. However, when a website is built using decoupled architecture, Marketers have far more flexibility to upgrade the back-end technology powering a site or to update design and create new experiences independently of each other. You’ll have the opportunity to create and change experiences as you learn more about your customers and prospects by working with your design team. This allows your front-end team full control over the user experience by leveraging their preferred tools and Drupal’s strength as a CMS. This means that marketers can engage designers based on their vision and strategy and break free of the limitations of a given tool and that designers can use the best tool to accomplish the desired feature. In our recent series on Weather Underground, Matt Davis gave a great example of how this worked with Drupal and Angular JS. Drupal is designed with large organizations in mind when it comes to storing and organizing content in a single repository. In addition, Drupal 8’s upgraded publishing functionality provides contributors a more streamlined experience for content creation. You are now able to give content creators a streamlined editorial experience and leverage Drupal 8’s RESTful API to make it more straightforward than ever for external applications or services to interact with content on your Drupal site. Decoupled architecture requires Drupal’s core web services to provide data to the front-end, pushing content to other places becomes more manageable. This is relevant because once you publish content in an article, it can be available for use in many places, including mobile apps, IOT devices, various feeds, and in other ways that haven’t been created yet. A recent study by Black Duck Software found that more than 78% of enterprises run on open source, with fewer than 3% indicating that they don’t rely on any open software. Given the key drivers for open source adoption are flexibility, scalability and speed, it’s no surprise that Drupal has become more popular than ever in recent years with Enterprise organizations. These organizations have learned that the more content you have, the stronger Drupal is at helping to categorize, store and structure that information. What makes Drupal particularly unique is the back-end experience. When using a decoupled architecture to separate the front-end and back end, you open the door to a variety of potential programming languages and design philosophies to accomplish your goals. This means the options are limitless with what your team can envision, what your UX/UI team can create, and who can help you create them. Overall, decoupled architecture is a concept gaining popularity across the development community given the benefits and potential upside. In our next post, we’ll discuss the various options for decoupling, the differences and pros/cons of each.